Why do we wear shoes? I mean, it isn’t like cavemen used to camp outside for 2-3 days to cop the freshest pair of shoes from the Air Jordan Hunter Gatherer collection. Yet, they seemed to have done alright fighting to survive day in and day out. Nowadays everyone always has a pair of shoes on unless they are swimming or showering. Hell, I have never even seen my own dad’s feet (true story). But why is that? Do shoes improve our physical capabilities in sports or are they holding us back? What about when it comes to weightlifting? With all the different shoes available, marketing hype from brands, and preaching from gurus, we thought it was time to put an end to it. In this article, we investigated what footwear is best when weightlifting and how to find the perfect pair for you. Our primary focus was on the barbell back squat as the current body of published research has focused almost exclusively on this lift. 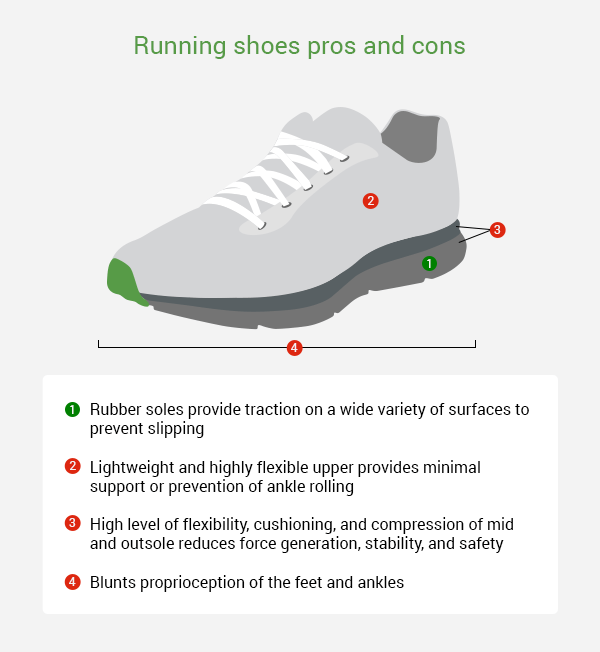 For this study, we reviewed the current literature on the subject and narrowed our focus to 25 peer-reviewed scientific publications which offered in-depth analyses of lifting footwear. Additionally, we interviewed 11 experts ranging in backgrounds from biomechanics, kinesiology, and neuromuscular functioning, to strength & conditioning coaching, strength training coaching, professional and world record-setting powerlifters, and professional bodybuilders. Dave Tate - Founder and CEO of EliteFTS with three decades as a powerlifter with 20,000 hours of strength consulting as well as an author of 20 books and over 500 articles for magazines and prominent websites. Frances Manias - Physique Coach and founder of Iron Sisters, 5x National Bodybuilding Championship and 2x National Powerlifting winner, and only Canadian to represent their country in both the IFBB World Bodybuilding Championship (7 times) and IPF Powerlifting Championships (2 times). Bryce Lewis - Founder of TheStrengthAthelte.Com, strength coach, professional powerlifter, and record holder in both the USA Powerlifting Federation and International Powerlifting Federation. Lauren Cohen - Competitive Powerlifter, record holding squat in the state of Maryland, and professor of finance & innovation at Harvard Business School. This article will focus on the back squat as defined by NSCA guidelines. This focus is taken while being aware of the many variations of the squat. The footwear being investigated are running shoes, weightlifting shoes, flat soled shoes, and minimalist (barefoot-like) shoes. 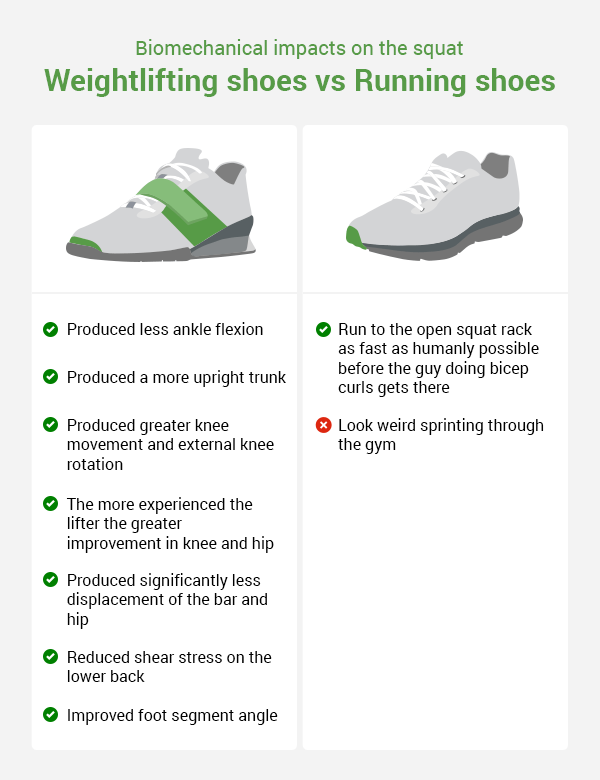 When drawing conclusions on what shoes to wear, considerations are taken for the different squatting styles and other lifts. Establishing the fundamentals of a properly performed squat is necessary to understand how footwear impacts the lift. In the typical back or front squats, descend only until the tops of the thighs are parallel to the floor or slightly below. The ankle is supported to prevent rolling of the ankles. Support allows for “spreading of the floor” (applying force to the ground in an outward manner as if you were trying to spread the floor apart during the squat). 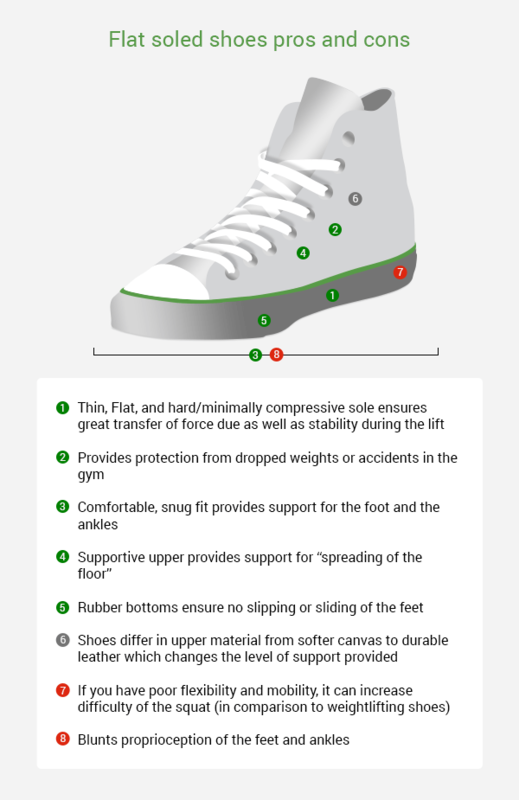 A “snug fitting” shoe to eliminate movement of the foot within the shoe. Bonus points for the inclusion of a metatarsal strap and/or ankle strap for additional support. This data will be weighed equally in importance in our conclusions as the anatomy of the shoe and expert insights. The weightlifting shoe saw improvements in almost every aspect of the squat in comparison to the running shoe. These benefits seemed to increase as the level of experience of the lifter increased. 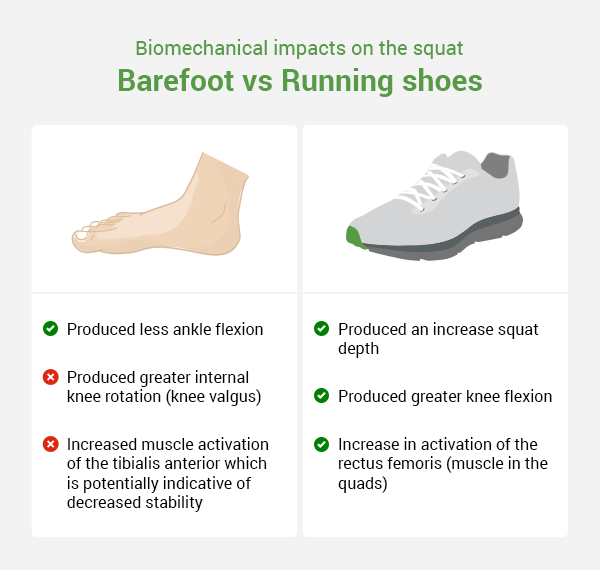 The running shoe condition produced greater squat depth, ankle flexion, and knee flexion in comparison to the barefoot condition. All three of these factors are correlated with each other positively, as long as proper form is maintained. Another point of concern arises for the barefoot condition with the increase in muscle activation of the tibialis anterior. This muscle is involved in the dorsiflexion of the foot and for maintaining balance. The researchers suggested that this increase in muscle activation was due to a decrease in stability while lifting barefoot. One study found that having a raised heel helped reduce forward trunk lean at the bottom of the squat. Another study noticed no differences. Leaving the investigation with some contradictory results. Researchers did make mention that it is possible that the lack of difference is due to the inexperience of the volunteers. Previous studies comparing running shoes and weightlifting shoes demonstrated that the lifters with more experience had greater benefits from weightlifting shoes. Making it possible that the lack of improvement between the barefoot and weightlifting shoe when squatting was due to this variable. One important finding was focused on the movement of the knee during the squat. Researchers found the weightlifting shoes produced greater external rotation of the knee. An aspect of form that helps with keep shins vertical, spreading the floor, and proper knee tracking. At the same time, barefoot volunteers demonstrated a greater level of internal knee rotation. The inward movement of the knees during squatting is dangerous and can lead to knee pain and injuries. There are three materials in particular that require a brief explanation to help understand the breakdown of each shoe. Ethyl vinyl acetate (EVA) - A highly compressible, lightweight foam material found in the midsole. The cell-like structure of the material “breaths” gas with each step providing its supportive cushioning, shock absorption, and spring-like qualities. Has poor longevity as the support and rebound of the foam deteriorate with use. Polyurethane (PU) - A dense and durable synthetic plastic. As a foam, it is found in midsoles that provide greater longevity than EVA but less compression and cushioning. As a spray, it is used to coat the exterior of shoes to provide greater durability, support, and abrasion resistance. Thermoplastic polyurethane (TPU) - Non-compressible, tough and durable synthetic plastic that can be found in almost every aspect of a shoe. Can be modified to change its properties for specific use in a shoe and specific benefits for the user. Provides long-lasting stable support in midsoles, structural support as overlays on the upper, and stiff support in the shank and medial post. Plain and simple, if you are lifting weights, ditch the running shoes. A weightlifting shoe or flat soled shoe outperform a running shoe when it comes to weightlifting in every possible way. Need more evidence? Two studies deliver the goods using a foam pad and an unstable platform, both of which are comparable to a running shoe. The first study found that squatting on a foam pad led to a decrease of force production of 7-10%. The second study found that squatting on an unstable platform was detrimental to the kinetics and technique of the squat itself. Therefore, running shoes make squatting and weightlifting unsafe while also reducing your overall performance. Running shoes should only be worn for conditioning work or cardio. If you aren’t doing any of those, then leave them at home. If you are doing those as well as lifting weights, then bring another pair of shoes to lift in. Other options consist of multi-density EVA which makes it hard and non-compressible or other “old school” options such as stacked leather or wood. Typically made of TPU stacked upon each other or in unique constructions much like pillars. Again, some are also made of wood or stacked leather. The construction of the weightlifting shoe provides maximal amounts of support, stability, and force transfer to the ground. The material ensures it is as safe as possible to reduce any chance of slippage, ankle rolling, or movement within the shoe. The heels come in varying heights to best suit the individual, which provides its own benefits. Consider an example of two individuals squatting. We will refer to them as Green and Blue based on the colors they are wearing in the image. Green is wearing flat soled shoes and Blue is wearing weightlifting shoes with a raised heel. Both lifters are trying to squat to the greatest depth they can. In this example, the angles are hypothetical to demonstrate the point. In the standing position, Blue has less ankle flexion which provides 10 degrees more at the ankle. This is due to the raised heel increasing the heel to toe drop of the shoe. Both lifters have the same ankle flexion at their respective maximal depth. At this depth, Green’s knee is in front of the toes while Blue’s are slightly past the toes. This is due to the bonus 10 degrees of ankle flexion Blue has in the ankle. As the ankles flex, the knees follow. Allowing Blue to move the knees further forward while still being in an optimal position. 1) The heel shifts the balance of the weight and the lifter forward. The balance shifts further forward with the increased forward movement of the knee. To compensate for this imbalance, the torso stays more upright and the lifter can squat to greater depth. 2) The increased mobility in the ankle and forward motion of the knee creates more space and leverage for the further depth of the squat. What exercises are weightlifting shoes best suited for? Weightlifting shoes are primarily used for squats (all variations), snatches, cleans, push press, jerks (all variations), military press, and any accessory exercises used to improve the form and performance of the Olympic lifts or squats. Outside of these lifts, you can still wear weightlifting shoes or put on another pair. It all comes down to individual preference. Typically it is advocated to not use weightlifting shoes for deadlifts as it puts the lifter in a disadvantageous position by increasing the amount of movement required to perform the lift. 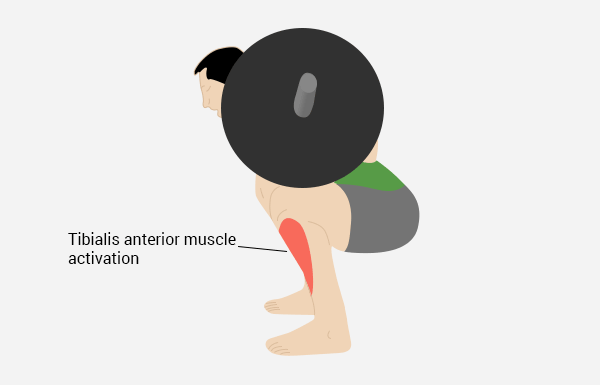 For sumo stance deadlifts, options with greater ankle support and traction are preferred such as flat soled shoes, wrestling shoes, minimalist shoes, and zero drop shoes with minimal sole height. 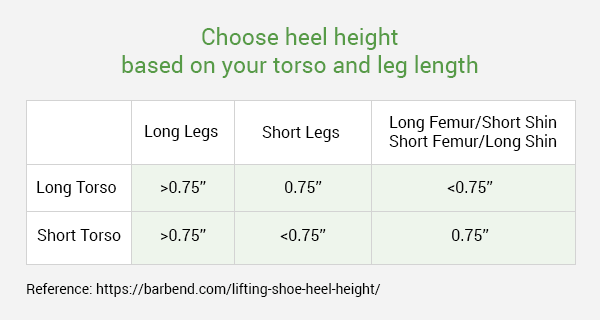 Weightlifting shoes generally vary in heel height from 0.6 inches to 1 inch. The following are general guidelines on how to choose the right height for you by taking into consideration your body type and squat style. Wide stance squatting and low bar positioning usually is a more hip dominant movement that requires less ankle and flexion making the lower heel more suitable. Knowing your body type allows for a more individualized understanding of the right heel height for you. General flat soled shoes like the Chuck Taylors All Star High Top have been a staple for professional powerlifters. Although they lack the special features and lifting specific construction, the simplicity and cost-effectiveness has made it an easy choice. 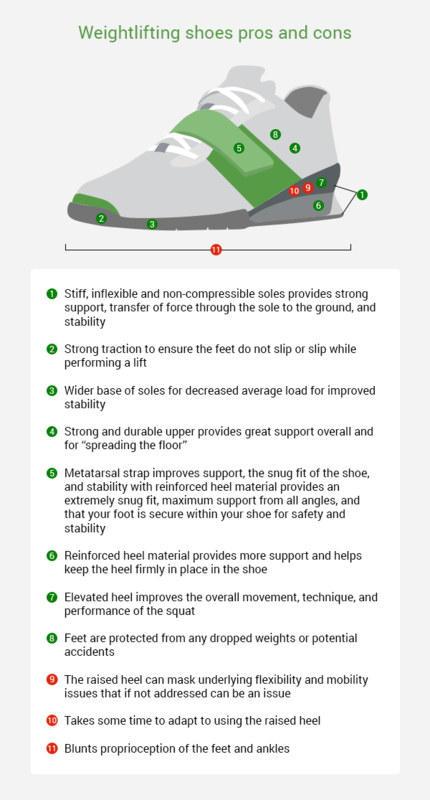 They check off all of the essentials of the firm, flat sole, minimal compression, and are viable options for the majority of lifts you will do. If you aren’t looking to spend the extra money or don’t require top of the line equipment, a pair of Chuck Taylors, Reebok CrossFit Lite LTR, other zero drop training shoes, or even wrestling/boxing shoes are great options. 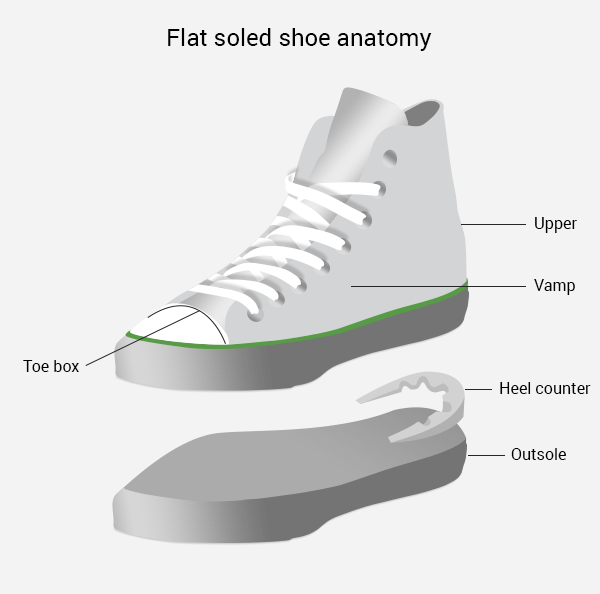 Although many have set records in Chuck Taylors, it doesn’t make them the best choice when it comes to the flat soled shoe option. Riding economy on your next flight will definitely get you from point A to point B, but it is damn sweet to fly first class with all the amenities. 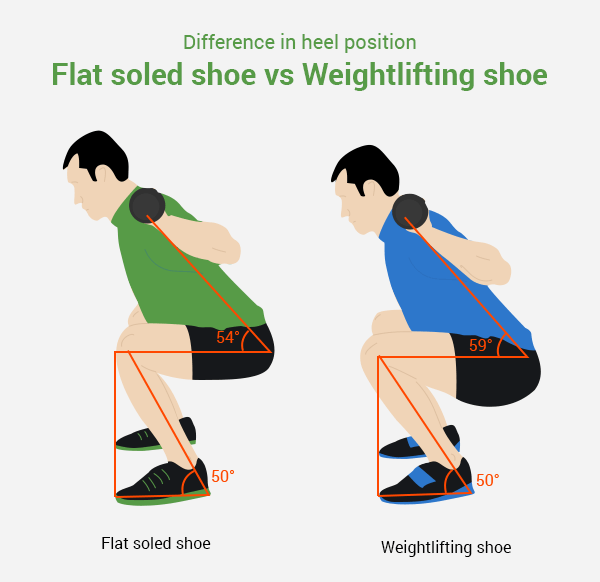 Lifting-specific flat soled shoes are specifically and comprehensively designed to benefit the lifter. They remove all the headaches of "economy seating" and upgrade you to a whole new world. They deliver on all the benefits of a weightlifting shoe without the heel. These options have great traction, support, optimal fit, and include metatarsal and/or ankle straps. Although there aren’t a ton of options, the options like Metal Powerlifting Shoes, Gorilla Wear High Tops, or even weightlifting shoes with the heel removed from a cobbler (yes, it’s a thing) will deliver in every way. Flat soled shoes are extremely versatile and can be worn for literally every lift you want to do. Why did we specifically chose the Vibrams FiveFingers? They are well known and closely resemble barefoot lifting. There are many other brands that offer similar options but we do not have any specific recommendations for brand or shoes in this option. 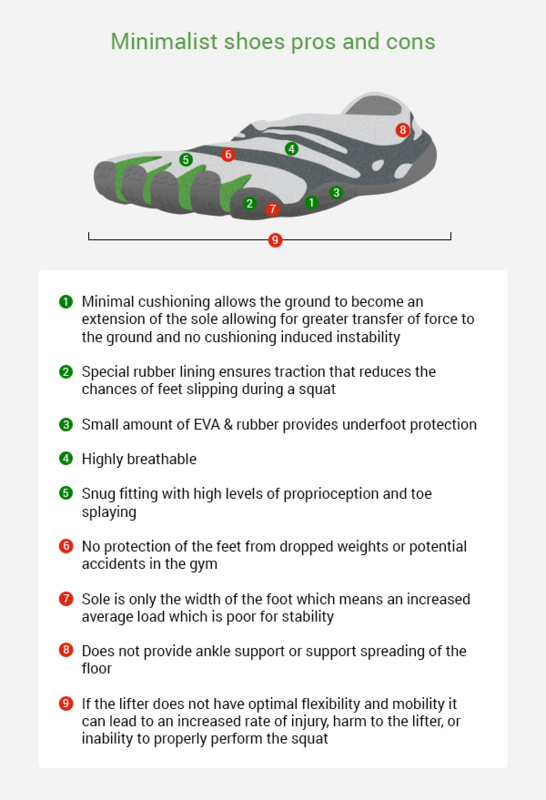 The barefoot or barefoot-like option provides the lifter with the “stiff, inflexible, and non-compressible sole” by making the ground itself the sole of the lifter. This allows for optimal transfer of force during the lift, as well as improved stability from minimal cushioning. This also provides maximum proprioception in the feet and ankles. Proprioception is the ability for you to know where you and all parts of your body are in space and the amount of effort being used in movement. You know, the thing you take for granted as you move a steering wheel with one hand, switch from break to gas with your feet, and reach for your coffee on your morning commute without taking your eyes off the road. As Dr. Joel Seedman explained, shoes tend to blunt the proprioception in our feet, ankles, and toes. The body still receives proprioceptive information from other areas of the body. Although, it will be missing critical information from the feet and ankles. This leads to less activation of the feet and ankles as well as other muscles involved in the lift. If barefoot is best for proprioception then the cloud-like cushioning of running shoes are the anti-christ. Where does that leave weightlifting shoes? 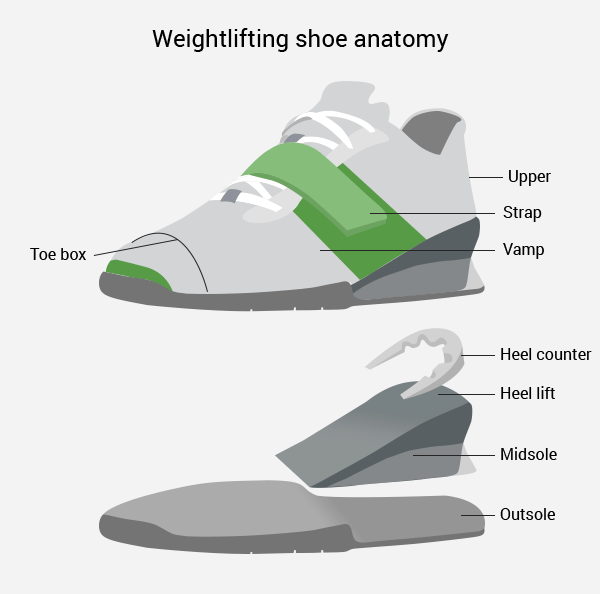 Mark Rippetoe argues that weightlifting shoes don't lose proprioception. He argued that the flat hard sole is much like the ground and that there is adequate space for toe splaying as well. Although he may be correct on this point, it isn't just these two factors. All the other structural support explained before significantly blunts the proprioception of the foot. 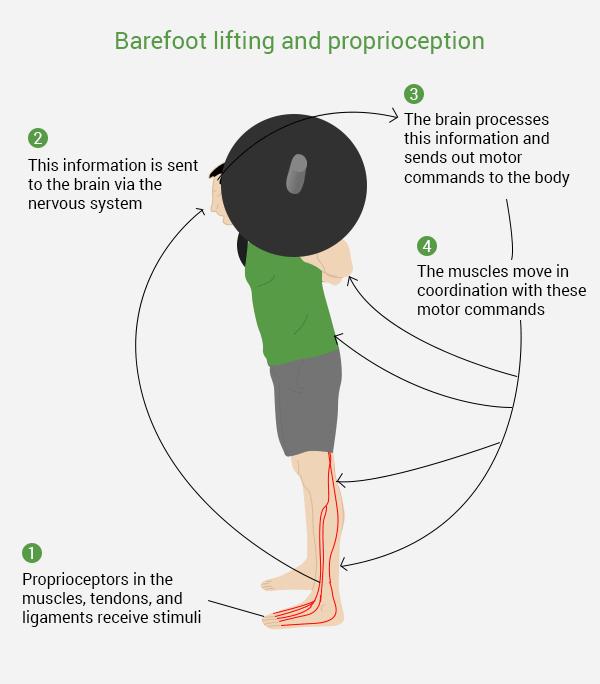 This makes the barefoot or barefoot-like options best for proprioception. 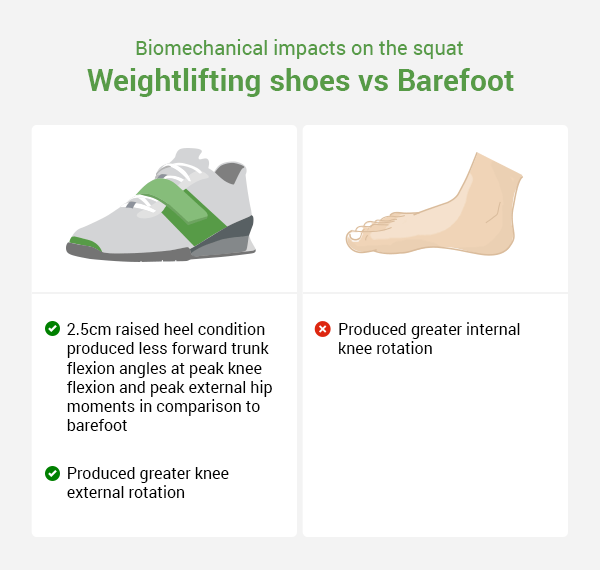 With weightlifting shoes having a significantly less than barefoot but potentially more than other shod options such as running shoes. The biggest concern that applies to both barefoot-like shoes and barefoot training is the danger involved. Firstly, there is no protection for the foot. As EliteFTS CEO Dave Tate put it, most long-term lifters will accidentally drop a weight on their foot. Raise your hand if this is you. Don’t worry… me too. 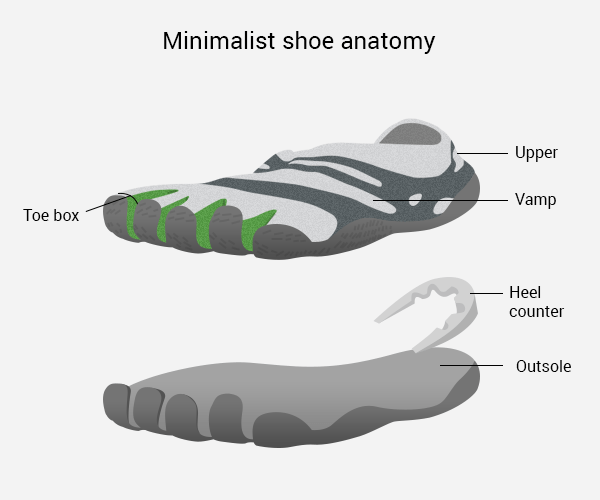 He went on to pose the rhetorical question that even if we made the assumption that barefoot lifting or minimalist shoes like Vibrams were “more optimal” options, does it really matter if it puts you in danger of breaking your foot or toe? Even Dr. Joel Seedman, a staunch proponent of barefoot training, agreed. He prescribed a great deal of effort to be put into strength, mobility, and flexibility exercises for the feet and ankles, as well as barefoot bodyweight training at home first. Then, over time, you can begin to do some barefoot training, before making it the main staple of how you operate. Going cold turkey on your shoes when training may leave you on injury reserve come time for that annual Thanksgiving flag football game. Shoes don’t only decrease our proprioception they also considerably replace the need for natural mobility and flexibility in the toes, feet, and ankles. The raised heel of the weightlifting shoe, in particular, reduces the need for proper mobility and flexibility. Allowing lifters to potentially use these as a crutch to mask underlying issues. Using these shoes as a crutch may lead to further complications, issues, and movement imbalances down the road. It doesn’t mean that you cannot use them, it just means that the necessary efforts need to be applied to improving mobility and flexibility. As Carlo Buzzichelli, The Director of the International Strength & Conditioning Institute, put it, “although I do own a pair of Adidas Powerlift 2, I can full squat any day, cold, narrow stance, and high bar, with any shoes.” He went on to explain that many lifters with good mobility still opt for the raised heel option to improve it even more. 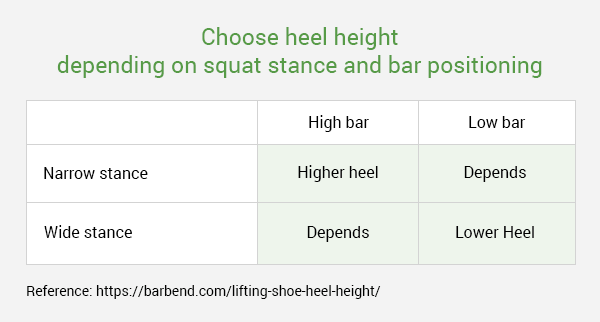 And if someone does have ankle mobility issues, picking up a weightlifting shoe with the raised heel definitely helps. With the athletes he trains, they perform exercises outside of the gym to strengthen the foot and improve mobility and flexibility. This is the point. Regardless of what option you opt for, a major focus on ensuring proper mobility and flexibility is important for performance, longevity in the sport, injury prevention, and safety. Focusing on these factors will improve your technique, performance, and overall well being much more effectively than any pair of shoes will. 1) Just lose the shoes and socks more. Simply being barefoot more often will be beneficial in and of itself. Plus, if you are home, do you really want to be dragging all of god knows what you have stepped on into your house? Win-win. 2) Begin doing bodyweight exercises while barefoot regularly at home. Squats, lunges, push-ups, and more are all simple exercises that you can do intermittently throughout that day while you are home which will help you start activating your feet and ankles and get you off the couch. More win-wins? I think so. Dr. Joel Seedman and Dr. Michael Yessis both agreed that exercising barefoot increases activation in the feet which in turn activates the body through increased proprioception and proper neuromuscular functioning. Both experts also agreed that if the time and effort have been taken to work on your mobility and flexibility, one could simply do the lighter weight exercises barefoot or in barefoot-like footwear. These could be for warm-up sets, volume training, and the likes where the weight is light for you. Then, as you start to increase the weight, put on the shoes of your choice. Allowing the lifter to receive the benefits of barefoot lifting and strap into their kicks for when things are about to get serious. Where these two experts may have differing opinions is that Dr. Joel Seedman suggests for going 100% barefoot when possible where Dr. Michael Yessis seemed to air on the side of caution suggesting to wear shoes for heavier weights. 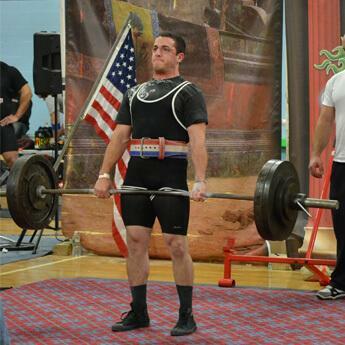 So what is the best footwear for weightlifting? There is no one size fits all answer to this question. Many articles and experts claim there is. They may be doing so with the right intentions but they lack the adequate evidence and science to do so. So let's get to the pudding. This takes some trial and error. You have to feel comfortable and supported in whatever footwear you select. You may try a raised heel option for a couple months and find that it just doesn’t suit you or you may love it. If the raised heel option is just not for you, then finding the right flat soled shoe will do you wonders. Identify the 50%, 75% and 90% of your one rep max on the squat. Make sure you have a spotter and proper rack equipment for safety. While lifting, set up a camera or your phone to record the lift from the side. Make sure that the camera is set up in the same spot, at the same angle, from the same distance, and you squat in the same spot. The goal is to minimize as many variables as possible, such as wearing the same clothes each time. Don’t worry, you can wash them in between gym sessions. Repeat this process for every shoe option you are considering. With all recordings collected, analyze the form of the squat in each shoe condition, frame by frame, to see how each option is impacting your technique and performance. With this experiment, you will have greater clarity on what type of shoe will help you perform the squat. You can either go with this as adequate evidence to “keep calm and train on” or test these options in different lifts as well. There is no one perfect shoe for everybody for weightlifting. Wearing a shoe will provide protection of the foot to help avoid injuries from dropped weights or accidents when weightlifting. With that said, some barefoot exercises at home and barefoot training at the gym can be very beneficial in the form of increased muscle activation and coordination. When training barefoot with weights, it is important to keep the weights light and then use the shoe of choice as you increase the weight. Running shoes should never be used when weightlifting. 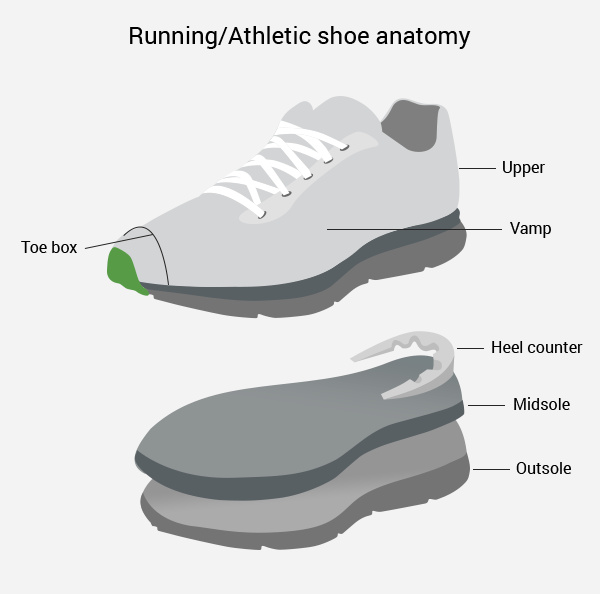 For performance, safety, and longevity, you should have a separate shoe for any type of running or conditioning and a separate shoe for weightlifting. The best shod options for weightlifting are weightlifting shoes and flat soled shoes. With these options, you need to take into consideration your mobility, flexibility, style of lifting, style of technique in specific lifts, and body type in order to identify the best potential options for you. From there, to find the best option for you, trial and error is necessary. Experimentation with the different footwear over time will allow you to identify which shoe works best for you. It is possible that different shoes perform better for you in different lifts as well, with many professional lifters having as many as four pairs of footwear that they bring to the gym and use regularly. Regardless of what footwear you chose, it is critically important for you to include exercises to increase foot and ankle proprioception, strength, mobility, and flexibility. Doing this will provide you with improvements in technique, strength, performance, reduced chance of injury, and overall well being far greater than a pair of shoes can. 1) Han D, Nam S, Song J, Lee W, Kang T. The effect of knee flexion angles and ground conditions on the muscle activation of the lower extremity in the squat position. J Phys Ther Sci. 2017 Oct;29(10):1852-1855. doi: 10.1589/jpts.29.1852. Epub 2017 Oct 21. 2) Lee SP, Gillis C, Ibarra JJ, Oldroyd D, Zane R. Heel-Raised Foot Posture Do Not Affect Trunk And Lower Extremity Biomechanics During A Barbell Back Squat In Recreational Weightlifters. J Strength Cond Res. 2017 Jun 19. 3) Charlton JM, Hammond CA, Cochrane CK, Hatfield GL, Hunt MA. The Effects of a Heel Wedge on Hip, Pelvis and Trunk Biomechanics During Squatting in Resistance Trained Individuals. J Strength Cond Res. 2017 Jun;31(6):1678-1687. 4) Slater LV, Hart JM. Muscle Activation Patterns During Different Squat Techniques. J Strength Cond Res. 2017 Mar;31(3):667-676. 5) Legg HS, Glaister M, Cleather DJ, Goodwin JE. The effect of weightlifting shoes on the kinetics and kinematics of the back squat. J Sports Sci. 2017 Mar;35(5):508-515. doi: 10.1080/02640414.2016.1175652. Epub 2016 Apr 20. 6) Chiu LZ, vonGaza GL, Jean LM. Net joint moments and muscle activation in barbell squats without and with restricted anterior leg rotation. J Sports Sci. 2017 Jan;35(1):35-43. Epub 2016 Mar 1. PubMed PMID: 26930422. 7) Lee TS, Song MY, Kwon YJ. Activation of back and lower limb muscles during squat exercises with different trunk flexion. J Phys Ther Sci. 2016 Dec;28(12):3407-3410. doi: 10.1589/jpts.28.3407. Epub 2016 Dec 27. 8) Southwell DJ, Petersen SA, Beach TA, Graham RB. The effects of squatting footwear on three-dimensional lower limb and spine kinetics. J Electromyogr Kinesiol. 2016 Dec;31:111-118. doi: 10.1016/j.jelekin.2016.10.005. Epub 2016 Oct 12. 9) Jaberzadeh S, Yeo D, Zoghi M. The Effect of Altering Knee Position and Squat Depth on VMO : VL EMG Ratio During Squat Exercises. Physiother Res Int. 2016 Sep;21(3):164-73. doi: 10.1002/pri.1631. Epub 2015 May 11. 10) Whitting JW, Meir RA, Crowley-McHattan ZJ, Holding RC. Influence of Footwear Type on Barbell Back Squat Using 50, 70, and 90% of One Repetition Maximum: A Biomechanical Analysis. J Strength Cond Res. 2016 Apr;30(4):1085-92. 11) Marchetti PH, Jarbas da Silva J, Jon Schoenfeld B, Nardi PS, Pecoraro SL, D'Andréa Greve JM, Hartigan E. Muscle Activation Differs between Three Different Knee Joint-Angle Positions during a Maximal Isometric Back Squat Exercise. J Sports Med (Hindawi Publ Corp). 2016;2016:3846123. doi: 10.1155/2016/3846123. Epub 2016 Jul 18. 12) Bae CH, Jeong YW, Lee JH. Analysis of muscle activations in lower extremities muscles at various angles of ankle flexion using wedges during static squat exercise. J Phys Ther Sci. 2015 Sep;27(9):2853-5. doi: 10.1589/jpts.27.2853. Epub 2015 Sep 30. 14) Andersen V, Fimland MS, Brennset O, Haslestad LR, Lundteigen MS, Skalleberg K, Saeterbakken AH. Muscle activation and strength in squat and Bulgarian squat on stable and unstable surface. Int J Sports Med. 2014 Dec;35(14):1196-202. 16) Murray N, Cipriani D, O'Rand D, Reed-Jones R. Effects of Foot Position during Squatting on the Quadriceps Femoris: An Electromyographic Study. Int J Exerc Sci. 2013 Apr 15;6(2):114-125. eCollection 2013. 18) Macrum E, Bell DR, Boling M, Lewek M, Padua D. Effect of limiting ankle-dorsiflexion range of motion on lower extremity kinematics and muscle-activation patterns during a squat. J Sport Rehabil. 2012 May;21(2):144-50. Epub 2011 Nov 15. 19) Clark DR, Lambert MI, Hunter AM. Muscle activation in the loaded free barbell squat: a brief review. J Strength Cond Res. 2012 Apr;26(4):1169-78. Review. 20) Sato K, Fortenbaugh D, Hydock DS. Kinematic changes using weightlifting shoes on barbell back squat. J Strength Cond Res. 2012 Jan;26(1):28-33. 21) Pereira GR, Leporace G, Chagas Dd, Furtado LF, Praxedes J, Batista LA. Influence of hip external rotation on hip adductor and rectus femoris myoelectric activity during a dynamic parallel squat. J Strength Cond Res. 2010 Oct;24(10):2749-54. 23) Drinkwater EJ, Pritchett EJ, Behm DG. Effect of instability and resistance on unintentional squat-lifting kinetics. Int J Sports Physiol Perform. 2007 Dec;2(4):400-13. 25) Fortenbaugh D., Sato K., Hitt J. The effects of weightlifting shoes on squat kinematics. In. Jensen R., Ebben W., Petushek E., Richter C., Roemer K., editors. 28th Conference of the International Society of Biomechanics in Sports; 2010 July 19-23; Marquette, Michigan, USA. p. 167.